Hey y'all! 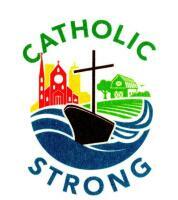 Make sure you check out everything St. Damien OCYM (Ocean City Youth Ministry) has to offer. We meet almost every Sunday for food, faith, fellowship, and fun [of course]. Check out our youth ministry page in the Inside Our Parish section of this website, or follow us at facebook.com/ocym1 or twitter @stdamienocym and instagram @o_c_y_m for the latest news and updates. As for my bio- I love the color yellow, a good cup of coffee, singing at the top of my lungs, and I have the best job in the world. Can't wait to meet you!